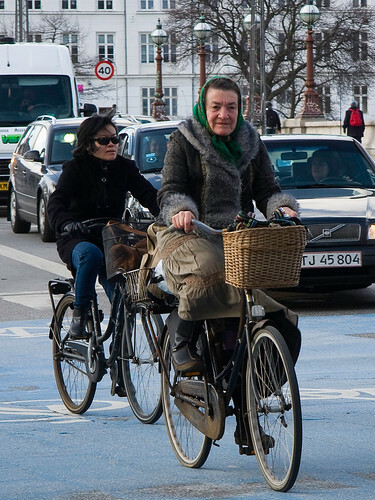 Copenhagenize.com - Bicycle Urbanism by Design: Go Green, Go Dutch, Go Die! Go Green, Go Dutch, Go Die! 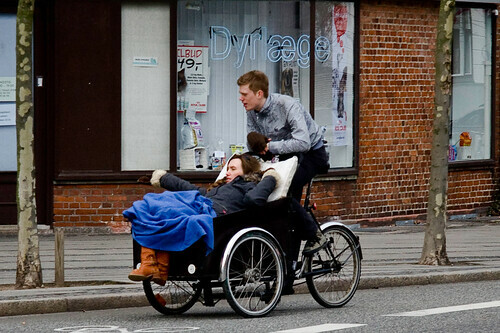 Here we have a couple of Copenhageners who are partipating in a "strenuous activity beyond the capability of some people and that may cause minor, severe and/or permanent injuries or death to people who are not in sufficient physical fitness, training and/or experience." And here we have two individuals who have "Acknowledged that some Bicycling is a test of their physical and mental limits and carries with it, regardless of physical fitness or experience, the potential for death, serious injury and property loss. They have assumed the risks of participating in Bicycling. They certify that their level of fitness is appropriate to participate in Bicycling which they are voluntarily undertaking." What am I on about? One of our readers, Dottie, is a lawyer in Chicago and she loves urban cycling. The Dutch Embassy and Consulates in the US and Canada have a bike ride roadshow called Go Green, Go Dutch, Go Bike! wherein they promote cycling and the wonderful Dutch bicycle lifestyle. So far, so good. Dottie thought she'd sign up for the Dutch bike ride in Chicago on May 8th, 2010, co-sponsored by the Active Transportation Alliance. "I thought you might be interested in the following "waiver and release" I was required to agree to when registering for the Go Green Go Dutch Go Bike! event that the Dutch Consulate is sponsoring in various North American cities. The Chicago ride is being hosted by the Active Transportation Alliance, a bicycling and pedestrian advocacy organization, and this is their language. I'm a lawyer, so I understand the importance of participants signing waivers, but this language seems extreme and unnecessary, not to mention ironic considering the message of the ride. Anyone who stops to read the language should be scared shitless. Also, note that we are apparently required to wear helmets, even though the ride will be on a lakefront bicycle path, completely separated from motorized traffic. A lot of this language is legally unnecessary, especially this bit that bothers me the most - "Bicycling is a test of a person's physical and mental limits." Ridiculous. I'm hopeful that the helmet rule will not be enforced." Right... take a minute to recover from THAT intensity... okay... ready? I wonder what the Dutch Consulate makes of all this? At a similar event in Vancouver, all the participants were clad in Roadside Garbage Collector Chic in the form of hi-viz vests. So much for celebrating the relaxed world of Citizen Cyclists in the Netherlands. This much be, for example, how the French feel when, after a couple of centuries of exporting excellent cheeses, see 'Cheese in a Tube' in supermarkets in other countries. "Um... excusez-moi... that's not what we meant..." Lost in translation, indeed. It's perhaps one thing that the hotel I stayed at in Portland (yes, THAT Portland) had a hellfire and destruction waiver release for guests to sign if they wanted to borrow a bicycle. [The text is in the middle of this previous post.] I would, however, expect more from an advocacy group dedicated to cycling. So here comes the Waiver and Release text for the Dutch Bike Ride in Chicago. Ambulances will be standing by along the route. 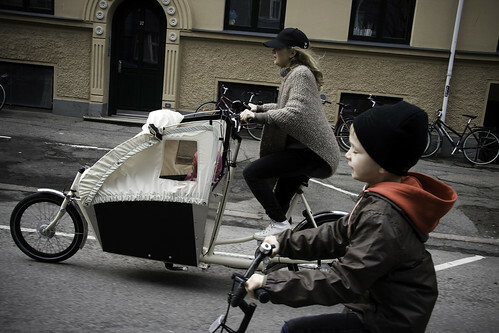 And remember to enter to win the Gazelle bike with a top speed of about 12.4 km/h! What you're about to read is not just a silly, unecessary legal form. It is, quite simply, the death knell for the future of urban cycling in America. Choose a song from this site to listen to whilst you read the text. If this is the way cycling is marketed, presented to the public - both cyclists and the 'bicycle curious' - and branded - and by an advocacy group to boot, then I firmly believe there is little hope for a sea change in urban cycling. And before the usual "you don't understand... this isn't Copendam/Amsterhagen... we don't have bike lanes and all that..." comments roll in, just let me say that a sea change IS afloat in many a country without adequate infrastructure (yet) and with a all-dominant car culture. The marketing... the marketing is right on the money. Urban cycling is being sold properly and effectively and those countries will start reaping the societal and health benefits in no time. By clicking below, I hereby acknowledge that bicycle riding, bicycle racing and bicycling events (“Bicycling”) are strenuous activities beyond the capability of some people, and may cause minor, severe and/or permanent injuries or death to people who are not in sufficient physical fitness, training and/or experience. I have made my own determination as to whether I am able to safely participate in Bicycling. I recognize that the Active Transportation Alliance (“Active Trans”) has not evaluated my ability to participate in Bicycling. I also recognize that advice dispensed through Active Trans may not be appropriate for me, and it is my responsibility to make this determination. I acknowledge that some Bicycling is a test of a person’s physical and mental limits and carries with it, regardless of physical fitness or experience, the potential for death, serious injury and property loss. I assume the risks of participating in Bicycling. I certify that my level of fitness is appropriate to participate in Bicycling which I am voluntarily undertaking. I certify that I have sufficiently trained or prepared for the Bicycling I am undertaking and I have not been advised against participation in such activity by a health care professional. I agree to wear an ANSI, CPSC, or SNELL approved helmet properly at all times while participating in Active Trans bicycling activities.